Interior architects designing modern and flexible workspaces that fit your needs. We are Kirksey Interiors - a creative and driven team that is passionate about designing from the inside out. Modern work environments call for open floor plans that inspire collaboration and support productivity. 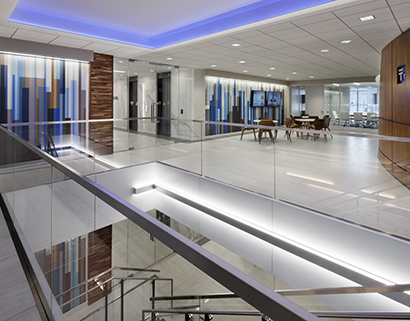 Working in tandem with clients, our Interior Architecture Team creates functionally efficient, modern, employee-friendly work settings that add measurable increases in productivity and employee retention. Each project is unique in its solution to meet our clients' needs, maintaining high standards of design and construction techniques. The Kirksey Interiors team is led by Brian Malarkey and Interior Architecture Design Director, Randall Walker. Both have shaped their careers with a commitment to high, strategic design and sustainable practices. As a team, we have a proven ability to work with clients and understand their processes, determine future facility needs, and design solutions that make the most sense for the organization. We specialize in designing modern workplaces that include collaboration spaces, access to daylight & views, amenity spaces, and fully integrated audio-video and information technology.